Rosewood offers private and open artist studios, art birthday parties, locker rentals and plenty of spaces for event rentals. Contact Rosewood at rosewood@ketteringoh.org or 296-0294 if you'd like to reserve a room, book a birthday party or have questions about using our open studios! 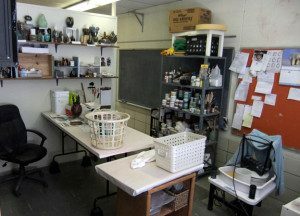 **Our Darkroom, Ceramics, Jewelry and Glass open studios require a brief, no-cost orientation and demonstrated ability to use these facilities. For your convenience, any Rosewood staff member is able to perform an orientation for the studio of your choice. Orientations usually last about ten minutes. Simply stop by the front desk and ask for an orientation! No orientation is required to use the dance or painting open studio facilities. 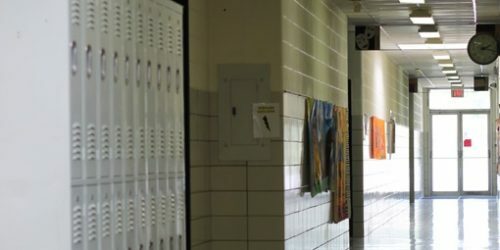 Rent a Rosewood locker for six months or one year. Get a discount by choosing a one-year rental! Six-month rental: $35/Kettering Resident; $40/Non-Resident. Rosewood Arts Centre is the ideal place for your club or organization’s meetings. With rooms that can host groups as few as five and as large as 150, the facility offers a comfortable atmosphere and numerous amenities. Conveniently located in the heart of Kettering, Rosewood Arts Centre is near major interstates and hotels. The rentals include free room set-ups. Theatre rental does not include a lighting package. An extra staffing charge of $20/hour will be applied to rentals extending past Rosewood’s normal business hours. A security deposit equivalent to one hour of room rental is required. An additional deposit may apply for equipment use in the theatre. Non-profit arts organizations will see a reduction of $10 per hour on all spaces. All non-profit art organization rentals must have on file a 501-C Internal Revenue Service classification letter for non-profit organizations. To qualify for the resident status as a non-profit organization, the non-profit membership list must be at least 51 percent residents of Kettering, or the Internal Revenue Service Non-Profit classification letter must be registered to a Kettering address. Celebrate your child’s birthday with an Art Party at Rosewood! Choose from painting, clay or printmaking for a fun, memorable, creative day! Pricing starts at $200 for 10 children. Appropriate for ages 3 – 12. Open studio sessions are designed to allow artists and craft persons the opportunity to work on their own projects in a creative environment with equipment perhaps not available to them at home. The studios are open for independent work Monday through Saturday. Hours are determined by class schedules. All participants and observers must pay open studio fees to stay longer than 30 minutes. Children under 5 years old are not permitted in open studio; those under 16 years must be supervised by an adult 21 years of age or older (no more than two children per adult). All studio patrons, including currently enrolled students, should sign in and pay fees at the Rosewood office. All open studio work in progress may not be left more than 30 minutes unattended. The pottery studios at Rosewood feature three areas available to the public: a wheel room, a glazing room and a room for hand building. 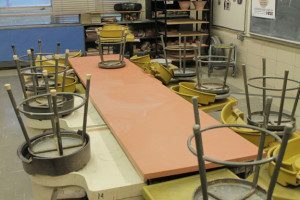 In order to use the studios, previous experience in ceramics is required. Introductory classes in both wheel pottery and hand building are offered on a regular basis. Please contact the Rosewood office at 937-296-0294 for details. 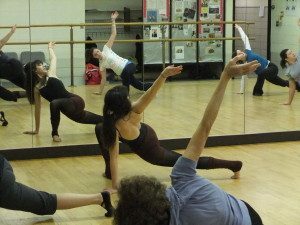 Studios are available to the public when classes aren’t in session. A free orientation session is required before access to open studio can be granted. Clay purchased at Rosewood may not be removed from the facility for work at home, and you must supply your own tools. Tool kits are available in the office for $14. Clay purchases include glazes and firing fees. Porcelain (cone 10) is available at additional cost. Cone 10 Reduction Firing: Reduction firing is now available at no additional cost for Rosewood studio users. A no-cost reduction kiln orientation is required. Please contact the Rosewood main office with any questions about reduction firing. Clay body #308 red clay cannot be fired in the reduction kiln. Both the electric and reduction kilns may also be rented if you wish to fire projects from your studio at home. 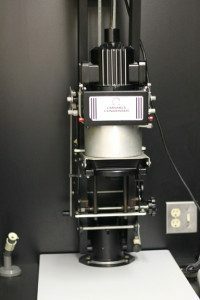 The Rosewood Arts Centre is proud to be one of the only facilities in the Dayton area that offers a darkroom for public use. The darkroom can comfortably accommodate up to 10 people with 10 enlargers. All chemicals needed for black and white photography processing are included in studio drop-in rates. 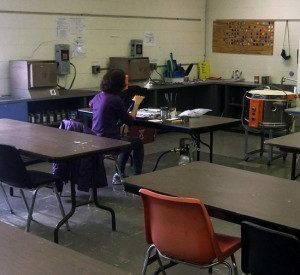 The darkroom is only available when classes are not in session. Please call in advance for available times. The painting studio at Rosewood is complete with sturdy, large H-frame easels that can easily accommodate canvases up to 6 feet in height. A large podium is available for setting up a still-life display or can provide plenty of space to study the human form. The studio is available when classes are not in session. Call for available times. No paint, thinners or other supplies are provided. Featuring a dance floor that is 24’ x 30’ the dance studio at Rosewood enables dancers of all abilities the opportunity to practice their craft. A wall with mirrors gives dancers the opportunity to perfect their choreography for the next big recital or competition. Barres extends along two walls for added convenience. The dance studio is available when classes are not in session. Please call for more details. A stereo is provided. We have two kilns available for annealing small projects up to 10” wide by 10” deep by 6” tall. Firing fees are in addition to the drop-in rate and must be purchased in advance. The jewelry studio at Rosewood is for experienced jewelry artists or those currently enrolled in a jewelry class at Rosewood. In order to use the jewelry studio, participants must demonstrate previous experience in jewelry making, plus complete a brief, no-cost studio orientation with a Rosewood staff member. For your convenience, any member of our staff can complete an orientation within 10 minutes, and no reservation is required. Artist studios are available at Rosewood Arts Centre and applications are accepted on a rolling basis, reviewed as studio spaces become available. 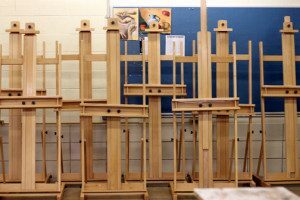 Spaces are available for artists with an active practice and a commitment to sharing their work with the Kettering community. 10 x 10 studio spaces are $85/month for Kettering residents and $130/month for nonresidents. For more information about artist studios, please contact Rosewood at 296-0294. New! A deluxe 10 x 20 studio is available for $130/month for Kettering residents and $195/month for nonresidents. 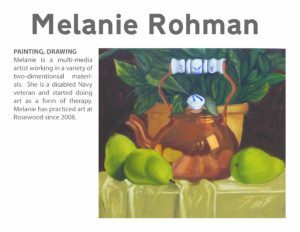 Multi-media artist, Melanie Rohman, is a disabled Navy veteran who holds an art degree in voc rehab. 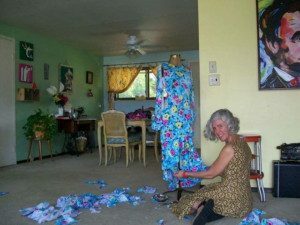 She began her artistic practice as a form of therapy and works in a variety of two-dimensional media. She has had a studio at Rosewood since 2008. 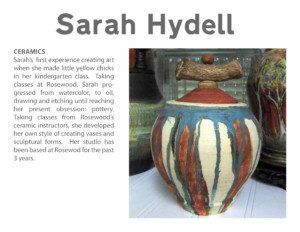 Sarah Hydell, a ceramic artist with experience in a variety of media, first experienced art making in kindergarten, when she enjoyed making a set of yellow chicks. In adulthood, she sampled watercolor, etching, drawing, oil and finally, pottery classes at Rosewood. Taking classes from Rosewood’s ceramics instructors, she developed her own style of creating vases and sculptural forms. Longtime studio renter, Pam Adams, is originally from Dallas, Texas. 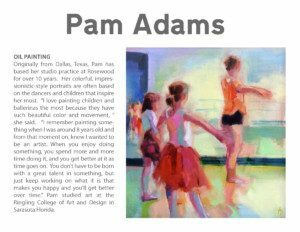 Her colorful, impressionistic portraits are often based on the dancers and children that attend classes at Rosewood. “I love painting children and ballerinas because they have such beautiful color and movement,” she said. “I remember painting something when I was around eight years old, and from that moment on I knew I wanted to be an artist. When you enjoy doing something, you spend more and more time doing it, and you get better at it as time goes on. You don’t have to be born with a great talent, but just keep working on what it is that makes you happy, and you’ll get better over time. Pam studied art at the Ringling College of Art and Design in Sarasota, Florida. 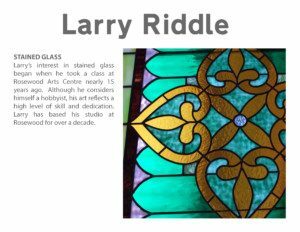 Larry Riddle‘s interest in stained glass began when he took a class at Rosewood about 15 years ago. Although he considers himself a hobbyist, his art reflects a high level of skill and dedication. His studio has been based at Rosewood for over a decade.